This is a new and prickly phase for the UN: a new Secretary General, a new Envoy on Youth, growing calls for reform, a combative Security Council, and the unpredictability of a Trump presidency (the UN’s single biggest financial contributor). Despite the reality of her office, she remains strident about the role of the UN in young people’s lives – and she’s taking on the UN system. Sometimes I’ve been very blunt in the way that I talk in our closed meetings and I know that the SG appreciates that. He has officially given me a task to misbehave in our meetings… and to call out when I see something stupid or something that I don’t believe. 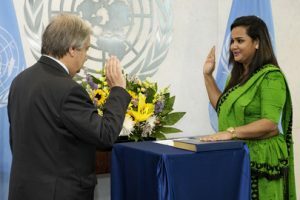 http://www.youthpolicy.org/wp-content/uploads/730608.jpg 405w" sizes=" 300px) 100vw, 300px" />Being sworn in as the second Envoy on Youth by the UN Secretary General, António Guterres. And by youth leadership, she means power. Young people have pushed for years to be at the table – and now they’re at several – but who is she, and what will she be pushing for? Jayathma’s youth career path makes her appointment a logical conclusion. She was the first UN Youth Delegate for Sri Lanka, worked at the National Youth Services Council, was part of the International Youth Coordination for the World Conference on Youth, and supported the Commonwealth Youth Forum. She attended the Global Forum on Youth Policies and later launched Hashtag generation, a campaign to get young people – especially young women – engaged in Sri Lankan politics. Sometimes going through security I have been denied access to important meetings because they don’t want to believe you are in the Secretary General’s senior management team. I have to show my badge and tell them that I am this person. They don’t let me just walk as they would a 50 year old white man – who they wouldn’t question. No, it’s real. It’s there. Despite his age and ethnicity, it is hard to imagine the strides of Ahmad Alhendawi – her predecessor – being denied entry to meetings. At a time when two women failed to shatter the highest glass ceiling, the #MeToo movement roared, and international agencies as well as aid organisations faced numerous scandals, does the UN still have a problem with women? I, and others in positions like me, face three types of discrimination: you face a discrimination as a woman, a discrimination based on your skin colour, and thirdly on your age. But Jayathma reflects, almost wistfully, that she ‘thought a lot about the opportunities – more than the challenges’ when applying for the role. The reality, it transpired, is not how she envisioned. Right now, too much of her time is taken up with ‘resource mobilisation.’ This has been a stark and urgent necessity. She is consumed by this, and she must be: if she wants to keep her office and staff, she must raise money from member states. While this is in the job description, what she inherited was not: her office is in debt to the UN. Though lightly briefed before taking office, her first months in the job have not been what she expected: instead of implementing her plans – a vision that secured her the role – she’s worked to pay off the $78,000 her office owes. It isn’t just the triple layers of discrimination that are hindering her work: her office is broke. Clearly, this is directly impeding her ability to be an Envoy. 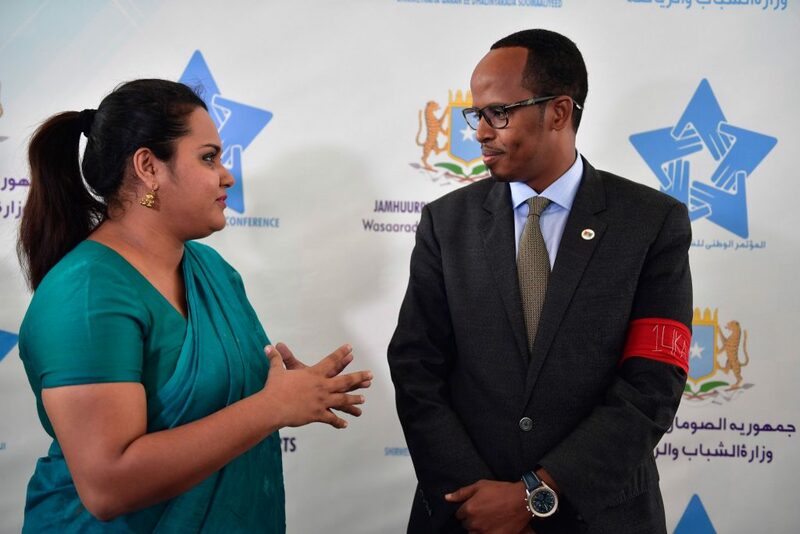 She was initially forced to decline an invitation to launch the youth policy of Somalia at their National Youth Conference – until the country office stepped in to pay. Similarly, she attended ICSW as a guest of CIVICUS. While the role of an Envoy is primarily seen as conferences and events attendance, in-country missions, speeches and meetings, for Jayathma it is not: ‘in reality it is half – less than half – the work I do.’ Rather, her day job is a continual fight for funding: chasing member states for their financial commitments; navigating the complex UN process of shifting money around; trying to prevent her staff being let go; and rapidly utilising her own networks to bring it much needed funds. This is yet another demonstration of the empty promises and unfilled commitments, especially by member states, for the youth sector. That this prestigious office – and that the Envoy on Youth – has been reduced to advising staff to take other, more secure positions lays clear the lack of substantive support for youth at the UN. http://www.youthpolicy.org/wp-content/uploads/DRXAVEYW0AErdJW.jpg-large-... 768w, http://www.youthpolicy.org/wp-content/uploads/DRXAVEYW0AErdJW.jpg-large-... 1024w" sizes=" 300px) 100vw, 300px" />Jayathma with the Mayor of Mogadishu at the launch of the national youth policy of Somalia. In our interview, she outlines three priorities of work: implementation of the SDGs; youth unemployment; youth, peace and security. While they are endorsed by the Secretary General, she can’t get her work plan signed off. She, rightly, doesn’t want to make commitments she doesn’t know will be funded. Jayathma’s priorities are mostly inherited from the existing workplan of the Office. She says, ‘I believe my job is to pick up on those efforts and to try and translate that into action’. But with no budget, she must rely on her power to convene and cajole rather than directly deliver. Like most of the UN system, her top priority is the implementation of the SDGs. Inspired by her work within a youth movement in Sri Lanka, she’s wants to ‘create a momentum – a movement – a generation of young people that care about SDGs, that make them their own and take action to implement them in their community.’ This seems like a huge ambition: for most young people, the SDGs remain – at best – an abstract concept. But, if the goals are realised they can undoubtedly transform the lives of adolescents and young people. Where is that momentum? There was huge momentum of civil society youth organisation and saying that these are our priorities for sustainable development. But now in the implementation process, where is that space? Where are young people and youth organisations? We must reform the ineffective hiring practices we have. Our young staff are always stuck as consultants, internships, lower level positions… then there’s a real challenge in retaining that talent. Arguably, Ahmad’s proudest achievement as Envoy, UN Security Council Resolution 2250 demonstrates the power that the role can have when used effectively. Jayathma comes from a country of huge instability, which is still emerging from the scars of a long civil war. For her, young people’s involvement in peacebuilding isn’t academic: it’s a lived experience from her home country of Sri Lanka. In a world that looks increasingly fractious – and with unpredictable leaders at the helm – youth as peacebuilders needs real investment. Though Jayathma is looking at similar resolutions – such as Women, Peace and Security – we’re unsure what to expect in this area and we’re hoping the forthcoming progress study to the UNSC will reveal more opportunities. But while her focus on harmonising at the UN is important, it risks being a shield for the fundamental challenge her office faces. With an empty bank balance, what power does she have to get things done at the UN? A renewed focus on youth policies? Youth – especially youth policies – risk being dropped from the global agenda. Though the national level sees huge energy, the international attention has faded. For youth policy, the Global Forum on Youth Policy could have been a watershed moment – but there was no follow up. Her master’s thesis – a comparative analysis on youth policy in Sri Lanka with the WPAY as a framework – gives hope that young people and public policy may be championed during her term. She says, ‘I’m passionate about youth policies – and it was one the priorities I outlined in the selection process.’ But why focus her masters on such an outdated framework like the World Programme of Action for Youth? I was interested in looking at the practicality of translating an international instrument into a national policy. We talk a lot of the international instruments and implementing them in countries, but most often we don’t know how to do it. It’s a lot of words and talking. To do this, member states need support. She’s particularly keen on being able to demonstrate the difference that policies make too – an area that must be strengthened in the years ahead. This support could have come from the aborted Global Initiative on Youth Policies – an ambition that could have given real impetus and direction if inter-agency politics hadn’t got in the way. At youthpolicy.org, we’re clear that this represents a failure of the youth sector to honour its commitments. Jayathma wants to host another Forum to explore and forge links ‘between the SDG framework and the youth policy frameworks that we have – and better streamline those together.’ This is a laudable ambition: youth policies must be harmonised – though still significantly augmentation – with the Sustainable Development Goals. This is partly realpolitik: if member states want UN support and finance, it needs to align with the global goals. But is yet another global event the right answer? Jayathma wants to better use the UN’s regional platforms instead – of which there are, apparently, a lot. ‘It’s very distanced’, she says before reeling off a list of acronyms. Our experience of directly supporting governments around the world shows that a country’s neighbours are often its comparator: regional youth forums on youth policy to explore more meaningful understandings and conceptualisations of policy and processes could be a far more useful approach – especially in areas where fewer youth policies exist, such as across Africa and Asia. At youthpolicy.org, we’d welcome the opportunity to reset some of the currently stalled commitments to youth policy. Jayathma is hamstrung by a debt that needs to be paid, which significantly limits the capacity and capabilities of her office. Right now, she is not in a position to do the things that she wants – the very things that got her the role in the first place. Like her, we want to see decent harmonisation at the UN, renewed focus on youth policies, proper implementation of the SDGs to make real changes in the outcomes for young people, better employment practices, and an end of conflict and violence. Young people need this to happen. In a side event at the CIVICUS World Assembly, she mentioned her love of psychological thriller novels. In many ways, she’s in the middle of her own melodrama at the UN. Let’s be clear: if states continue to renege on their commitments, this office will collapse. We cannot allow this to happen. No UN agency has the influence the Envoy commands and we must do what we can to ensure it survives, is capable of galvanising member states into action, and rigorous in holding governments accountable for their actions – and inactions – when it comes to youth. Let’s pay up, so that Jayathma can stop chasing money – and can finally start doing her actual job full-time. Written by Alex Farrow and edited by Andreas Karsten. Huge thanks to Jayathma for giving up her time for the interview. All photos taken from the UN Youth Envoy facebook account.